This is an encouraging word from Stephen Powell posted on the Elijah List this week. "A Visitation From a Presidential Guardian Angel - It's Time For Our Economic Boom"
I had just returned home from Buffalo after ministering in upstate New York on 9/27/16. I was tired and happy to be home after a run through Canada and Buffalo and Rochester. I had fallen asleep around 11pm, and soon dreaming and seeing things in my sleep. I found myself walking with a presidential protective detail following a U.S. president. The building we were in looked like an airport. It was very nice, very big, and brightly lit. Suddenly, the president stopped, and we all stopped with him. He turned around and started to scan the crowd looking for someone. This man was George W. Bush, our former president of the United States. When he found the man he was looking for beside me, he stretched forth his hand to greet this man and thank him for his service. This man was dressed like a secret service agent with a black suit, a white shirt, and a black tie. He had on glasses and his hair was black and shiny. The glory of the Lord was so strong in this encounter as the angel entered my night vision, that it literally took me out of my sleep, wide awake, after the Lord revealed the angel's name. Once I was awake I immediately grabbed my phone and looked up the meaning of the name Billy. The first entry that came up on the search said that Billy was a nickname for "William" which means "resolute protector". Surely this was a protector of presidents. Of course I couldn't fall back to sleep. I could still feel the glory of the Lord so strong as this angel stood over me, covering me in the glory. As I closed my eyes I entered into a series of visions over the next hour or so, which deal with America, the future of this nation, and what God will do with the influence of prophets in the Church over the next generation. In this article I will share some of the visions which I had. I will include my thoughts, interpretations, and Biblical and some historical findings which relate to the visions and revelations as I received them. I would like to say in this introduction that I am not an economist or a financial expert. I'm a minister of the Gospel who has heard the voice of God concerning these matters, and I wish to share it with you. Feel free to interpret for yourself and do your own study of the Word and history based on these words. • Antique Chairs Delivered at 1:14 P.M. I saw a flatbed truck backing up to my new home which was just purchased. The truck was carrying antique chairs to my house. Each chair was exactly the same. They were carved by hand from a dark hard wood. The cushions were dark green, and at the top of each chair where one's head might lean back against, and in the woodwork was carved the head of a wolf. These antique chairs were delivered at 1:14 P.M., and they were sent by Laura Bush, our former first lady. When I discerned the time of 1:14, I heard the voice of the Lord say, "This is Joshua 1:14." Joshua 1:13-14 Remember the word which Moses the servant of the Lord commanded you, saying, "The Lord your God is giving you rest and is giving you this land. 14 Your wives, your little ones, and your livestock shall remain in the land which Moses gave you on this side of the Jordan. But you shall pass before your brethren armed, all your mighty men of valor, and help them." After this the Lord said, "The Daniel Division." Then I saw a group of skilled, well-trained snipers maneuvering behind enemy lines in the war-torn part of a city. They were not firing their weapons. They were just gathering intelligence; they were invisible to the enemy's eye. They had some kind of cloaking device, a kind of special camouflage technology, that made them supernaturally concealed. But the intel they gathered was very accurate. In the midst of being caught up in this particular vision, I heard God say, "Cleveland." I saw a very large, powerful Bengal tiger pacing back and forth. Then I heard the voice of the Lord say, "I WILL MAKE THIS COUNTRY'S ECONOMY A TIGER ECONOMY AGAIN." In the first experience which awoke me from my sleep, I encountered an angel who has been guarding U.S. presidents for generations. In this experience I represent the Daniel Division that God is raising up. The same angels who work with presidents is now working with the prophets; and the work of both of these offices in the natural, will come together like Daniel and the Kings of Babylon and Persia came together. We will see this wonder in the earth again such as we have not seen it since the time of Daniel and Joseph. God will give Seer Prophets these literal seats of authority in the earth; not just friendly counsel over supper with these leaders. I see actual prophets occupying actual seats of authority. They will be paid appointed advisors to world leaders. In some cases they will actually be world government leaders. God has prepared them for this. Why did I see George W. Bush? Why did I see Laura Bush, the President's wife, delivering me these antique chairs? Why was there the head of a wolf carved into the head of each chair? Why is the Scripture that's revealed in this encounter (Joshua1:14)? The Scripture is Joshua 1:14 because this is America's time and this is the Church's time, which is being revealed here. Over the last year, since August of 2015, we have crossed over into our Promised Land spiritually, and the manifestation of this will continue to manifest in Kingdom proportions as this awakening continues to play out. Moses' command in this verse was to bring their families into the land and begin to settle the land, BUT STAY ARMED FOR WAR. 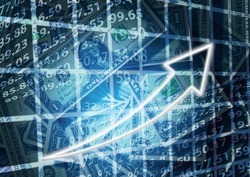 We are in the midst of the greatest economic boom this country and this world has ever seen. The Lord calls it "financial glory" which is being poured out. It will continue to manifest as we enter the United States' 45th presidency, which is of course the term of Cyrus as described in Isaiah 45, as many prophetic people know. The anointing of Cyrus is a kingly anointing combined with an anointing of financial glory to advance the tangible Kingdom of God on the earth. We will see the most amazing demonstration of this in our day! But as we prosper, we're to stay armed for war and not settle for just a piece of the land. The earth is our inheritance including all the seats of authority which have been typified by wolf leadership in many cases. Jesus said, "I send you forth as sheep in the midst of wolves" (Matthew 10:16). Yes there's giants in the land but the land is ours, and we were born to take the land! The Bush family is called by Peter Schweizer in his biography on the family "the most successful political dynasty in United States history" (click here). They are a symbol of combined financial and governmental power in the U.S. I believe Laura Bush delivering me the chairs, the seats of authority, that only the rich and powerful can usually afford, to be likened to Joanna (the wife of Chuza, Herod's steward) who gave financially into Jesus' ministry (see Luke 8:3). 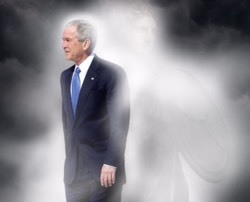 George W. Bush and his wife are known for being devout Christians. Joanna was one of Jesus' most faithful followers who was seen with Mary Magdalene and Mary the Mother of Jesus at His tomb after His resurrection (see Luke 24:10). So in effect, the wolf-like kingdom (Herod's kingdom), who tried to devour Christ at His birth, ended up directly funding Jesus' ministry through this financial steward's wife. Joanna means "Jehovah is a gracious giver" and Chuza means "seer". God will bring the governmental office of the prophet from the Church and the governmental offices from the world together – to finance and advance the Kingdom agenda for whole nations. It's time to see those sheep nations emerge! 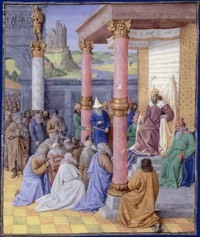 Cyrus' anointing is articulated (see Isaiah 45) as an anointing of Justice, Protection, and Financial Glory. The kingship of Christ is rising governmentally through a kingly company of people in the Church to directly influence the thrones of the earth with Heaven's might. It's the day of the King rising! The timing of this encounter is not coincidence since we've passed from September to October beginning the Jewish new year on the 2nd of the month! People are calling this Jewish new year "The Year of the Ruling Sword," and I think it fits! We're crossing over and it will come with an economic boom that will shock the world! 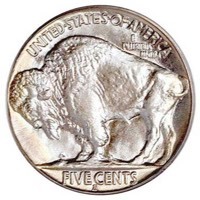 The words spoken in the silver buffalo nickel vision were clear: "I WILL TAKE AMERICA BACK TO ITS PROSPERITY OF 1885. I WILL DO IT AGAIN. I AM THE LORD." Then I heard voice of God call out the name "Cleveland." I had just flown from Buffalo back to my home in Charlotte, North Carolina, when this angelic experience and these visions occurred. Grover Cleveland was inaugurated in 1885 as our 22nd president (click here for Grover's bio). His rise to power marked the end of a 3-year economic depression in our country. As America is crossing another threshold right now we're coming out of a time of economic down turn and hardship. Grover Cleveland was formerly the mayor of Buffalo, New York. The buffalo is a symbol for America at the time of our strongest economic growth as a nation, the post civil war era, during the industrial revolution. The buffalo I saw was on a hat which then transformed into a silver buffalo nickel. The hat is a symbol of authority and government worn on the head. The silver is a symbol for redemption. The nickel is the number five which is grace. There is great grace on this nation right now to restore and redeem her economic power from a place of leadership. This economic endowment will be a launching-pad for the massive harvest which is upon us for the nations! The next presidency is being likened to the turn we took in 1885, the era of economic boom in that time, which elevated America as the wealthiest most prosperous nation on the planet (click here). The term 'tiger economy' is actually a real economic term, which I wasn't aware of until I came out of that particular vision and looked it up. A tiger economy is the economy of a country which undergoes rapid economic growth, usually accompanied by an increase in the standard of living (click here). In the late 1880's there was a boom not just in industry but creativity. There were thousands and thousands of invention patents filed with the U.S. government during that time (click here) because the spirit of creativity was unleashed in this nation. With the spirit of creativity comes the widespread creation of wealth and industry. Where there is no vision the people perish (Proverbs 29:18). It's time for restoration. It's time for the Lord to make us into a tiger economy again! Another interesting thing to consider about our nation becoming a tiger economy is the presence of the international banker angel. This angel has appeared to me twice within the last year, both times in central California, and this same angel used to appear to Bob Jones in visions. Bob used to always say that this angel worked in markets in Southeast Asia, namely the "tiger economies" of South Korea, Taiwan, Hong Kong, and Singapore. Well I believe the reason why this angel has appeared to contemporary American prophets within the last ten years is because he's here in America to help boost our economy as he did with the Asian tigers over the last twenty years.